March 15 - July 15th - Primary Nesting Season for CRP. No practice or management activity allowed. CRP SIGNUP DEADLINE - THIS FRIDAY - Feb. 26th ! Farmers and ranchers are reminded that the general enrollment period for the Conservation Reserve Program (CRP) ends on Feb. 26, 2016. Producers wishing to submit an offer in the General Signup are urged to contact the FSA office before Friday with the tracts they would like to consider submitting an offer. Participants in CRP establish long-term, resource-conserving plant species, such as approved grasses to control soil erosion, improve water quality and develop wildlife habitat on marginally productive agricultural lands. In return, FSA provides participants with rental payments and cost-share assistance. At times when commodity prices are low, enrolling sensitive lands in CRP can be especially attractive to farmers and ranchers, as it softens the economic hardship for landowners at the same time that it provides ecological benefits. Contract duration is between 10 and 15 years. The long-term goal of the program is to re-establish native plant species on marginal agricultural lands for the primary purpose of preventing soil erosion and improving water quality and related benefits of reducing loss of wildlife habitat. The 2014 Farm Bill continued the $50,000 maximum CRP payment amount that can be received annually, directly or indirectly, by each person or legal entity. This payment limitation includes all annual rental payments and incentive payments (Sign-up Incentive Payments and Practice Incentive Payments). Annual rental payments are attributed (earned) in the fiscal year in which program performance occurs. Sign-up Incentive Payments (SIP) are attributed (earned) based on the fiscal year in which the contract is approved, not the fiscal year the contract is effective. Practice Incentive Payments (PIP) are attributed (earned) based on the fiscal year in which the cost-share documentation is completed and the producer or technical service provider certifies performance of practice completion to the county office. Such limitation on payments is controlled by direct attribution. Program payments made directly or indirectly to a person are combined with the pro rata interest held in any legal entity that received payment, unless the payments to the legal entity have been reduced by the pro rata share of the person. Program payments made directly to a legal entity are attributed to those persons that have a direct and indirect interest in the legal entity, unless the payments to the legal entity have been reduced by the pro rata share of the person. Payment attribution to a legal entity is tracked through four levels of ownership. If any part of the ownership interest at the fourth level is owned by another legal entity, a reduction in payment will be applied to the payment entity in the amount that represents the indirect interest of the fourth level entity in the payment entity. Essentially, all payments will be "attributed" to a person's Social Security Number. Given the current CRP annual rental rates in many areas, it is important producers are aware of how CRP offered acreages impact their $50,000 annual payment limitation. Producers should contact their local FSA office for additional information. NOTE: The information in the above article only applies to contracts subject to 4-PL and 5-PL regulations. It does not apply to contacts subject to 1-PL regulations. Have you ever wanted an aerial photo of your farm or know how many acres of total wheat you planted last year? There is now software available for you to obtain that information without calling the FSA office. The 2014 Farm Bill mandates that USDA shares with the producer, or a designated agent, a web- based file format of that producer's information. This would include the Common Land Unit (CLU) data, related farm level data and other information generated by or for producers. In addition, this data would be provided in real-time and at no cost to the producer or designated agent. The new web based FSAfarm+ is designed to provide producers with that information. Producers must register for a level 2 eauth access as this allows the user to enter USDA web site portals that have been require higher security restrictions and a verified identity for each user ID and profile. 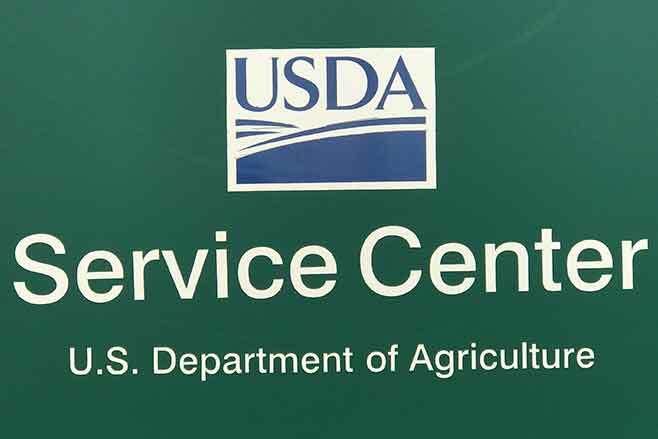 Producers who currently have the level 2 access can access can access their information at http://www.fsa.usda.gov/Farmplus. Producers who wish to obtain level 2 access, please visit the following website for the instructions on obtaining level 2 access. Producers will need to visit an FSA office for the identification process after registering which can be completed by supplying the Local Registration Authority (LRA) - which is an FSA employee, a copy of your driver's license. FSA's Farm Storage Facility Loan (FSFL) program provides low-interest financing to producers to build or upgrade storage facilities. The low-interest funds can be used to build or upgrade permanent facilities to store commodities. Eligible commodities include corn, grain sorghum, rice, soybeans, oats, peanuts, wheat, barley, minor oilseeds harvested as whole grain, pulse crops (lentils, chickpeas and dry peas), hay, honey, renewable biomass, fruits, nuts and vegetables for cold storage facilities, floriculture, hops, maple sap, rye, milk, cheese, butter, yogurt, meat and poultry (unprocessed), eggs, and aquaculture (excluding systems that maintain live animals through uptake and discharge of water). Qualified facilities include grain bins, hay barns and cold storage facilities for eligible commodities. Loans up to $50,000 can be secured by a promissory note/security agreement and some loans between $50,000 and $100,000 will no longer require additional security. Producers do not need to demonstrate the lack of commercial credit availability to apply. The loans are designed to assist a diverse range of farming operations, including small and mid-sized businesses, new farmers, operations supplying local food and farmers markets, non-traditional farm products, and underserved producers. To learn more about the FSA Farm Storage Facility Loan, visit www.fsa.usda.gov/pricesupport or contact your local FSA county office. To find your local FSA county office, visit http://offices.usda.gov.